I live one block off Broadway on New York City's Upper West Side. This morning I was on the way to brunch with a friend, and I saw something unusual: two and a half blocks of cabs and cars all lined up on the street. Parked. Only a few of them were there. The street corners were packed with police officers, people wearing orange reflective vests, and people with microphones and wires in their ears. I heard one of them say, "How do you spell brunch?" as he typed out a message on his iPhone? And then, many of them came inside the restaurant to join my friend and I. We sat at separate tables. I asked a few questions and learned that the crowd I saw had gathered together for a common goal: They are shooting stunts for a movie, Premium Rush. The movie is about a bike messenger, played by Joseph Gordon-Levitt who gets involved in a chase around the city. You can learn more about it on this blog, or via IMBD. Joseph Gordon-Levitt wasn't in my neighborhood this morning. Apparently the shots that are being filmed are what you will see as he zooms through traffic, but he won't be shooting the stunt. But before I left the scene, I did take a couple of mental pictures that I do want to share with you. It takes many staff to film a movie...more than I imagined. Did I mention there was an entire side street filled with trailers and production vehicles, too'? Despite all the job reports--the stories about lack of jobs in entertainment, for recent grads, etc.--there were people of all ages taking place in the shoot. There were people moving large scale equipment, people working to direct traffic, people who specialized in communication, videographers, technicians, and security. If I were in the movie industry, I could tell you who else was there, too. But that's not what I do. The mental picture I left with is just how many jobs there are--to take part in a big project. Not everyone gets to be Joseph Gordon-Levitt and star in a movie,or to perform stunts, or to work as a senior producer. But if you're in a rush to land the career you want, perhaps a good way to start is by finding out all the task that go into producing the finished product of your dream job--and then look for a side door. Do you have any experience with this? Share. I worked on college campuses for over a decade before starting my own business, and I've seen a lot of Pomp and Circumstance come and go. I've watched graduates saunter out into great jobs in a strong economy, and I've watched more than a few turn around and go straight back to school in a down economy. But regardless of whether you graduate this year, next year or you graduated five years ago, here are three statements that you can expect to hear--and which I think you should ignore. A CEO I once worked with loved to tell the story of a man who was angry with God because he hadn't won the lottery. He shook his fists and shouted at the sky, "Why haven't I won? I deserve it. I'm a good man, I've worked hard. Why won't you help me?" The clouds parted, a loud voice spoke. "My son, buy a ticket." Moral: You have to apply for jobs in order to be in the game. 2. You need a stimulus package to get a job. A recent Op/Ed in the New York Times pleaded for a stimulus package to incentivize employers to offer new grads entry-level jobs. While a stimulus package may very well help, it's important to remember that people are getting jobs--with regularity. According to the Department of Labor, nonfarm payroll employment has expanded by 573,000 since December. The number of unemployed is under 10% nationally. It's true that there are more unemployed recent graduates now than there were two years ago, but it doesn't mean that you don't have a chance of landing a job. You just need to pay attention to where the jobs are--both in terms of industry sector and in terms of location. Action step: Take a look at Indeed's job postings per capita or industry employment trends. Consider refining your search based on what you find! 3. You will enjoy living with your parents--forever. Every year, the percentage of recent graduates moving back home to live with their parents increases...While this may not be your plan "A," it may not be your parents either. Take a look at this New Yorker Shouts and Murmur's piece. Bottom line: Ignore the naysayers, and the gloom and doom statistics. Your job search isn't about numbers. It may be a numbers game to find positions, but in the end, people hire people--not resumes or online applications. Proof positive: All of the recent grads who were guest bloggers on this site last summer to discuss their "hire me" strategies have jobs. Full-time ones with benefits. Virtually every article I've seen about bright spots in the job market recently highlights the increasing demand for green jobs. So does my own homegrown research. Anyway you slice it, green jobs are in vogue--and there are more openings for workers in other field. But, even with all of the employer demand, there's a slight wrinkle: Many green jobs require technical training and an area of expertise in order to get hired. In many cases, you may find it very difficult to get an interview for a green job if you don't have knowledge of the field or industry in which you'd like to work. Unless you are a technical sales rockstar, and want to work in "green sales" related to a project you've worked on before, you may find that you need additional training--even to get to the interview. Many colleges and universities are rapidly expanding their environmental science and curricular offerings in order to meet student interest and employer demand for green jobs. But college can be expensive. Which is why I really loved this article from CNN Money on how you can train for a green job in two years. The secret (according to the article) is to attend community college. Many community colleges are offering innovative two year programs designed specifically to meet regional industry needs: it's a great way to hedge your bets for employment security. So check it out, if you are so inclined. 1. They cost less than many other colleges and universities. 2. In general, the academic job market is very tough for individuals who want to teach at the college and university level. And frequently, positions go to people based on their scholarly and research work--not just based on their love of teaching. So frequently, you can find devoted and --outstanding teachers--at the community college level. People who want to teach--not to publish the definitive last word on ____________. 3. Community colleges often have great feeder relationships with other schools--and you can still get a four year degree by transferring if that's what you want. Some states have stellar linkage programs between community colleges and state universities (The University of Virginia, for example, has great relationships and linkage programs with community colleges in Virginia.) If this is something you are interested in learning about, research this. Over the 8 years I worked at Ivy League schools, I met with several individuals who went to community college before "getting into an Ivy." All of these students had a great experience at the community college level. They credited their Ivy League admission in part to great teachers and mentors who believed in them and encouraged them. One of these students, a Philosophy major who had earned a 4.0 GPA at her new school, said that she missed her community college professors because they spent more time with her. I'm not saying that community colleges are better than Ivies, or that Ivy League professors don't care about their students. I'm just shedding light on the options--and a potentially hot one for this economy. Take a look--especially if you are thinking about going green! On the "Cookie Cutter" Approach to Job Search: Do You Need a Recipe? a) Are you witnessing job seekers who try to mimic everyone else in their job-search tactics (i.e., resumes that all say the same thing, job search action steps that mimic what everyone else is doing, etc.)? b) Are seeing unfocused and/or fearful attitudes (I don’t want to limit my possibilities so I’m throwing out a very big net) derailing job seeker efforts? What advice would you give to help job seekers differentiate in this tough market? In a marketplace filled with advice on how to differentiate yourself, I'm going to advocate for the importance of covering the basics. As my friends have shared with me in the past, "common sense isn't all that common." Recently, I had dinner with my friend, "Julie," a very senior recruiter. Julie has survived three rounds of layoffs in her New York firm--she's the only executive recruiter left standing for her industry sector. I asked her how she looks at resumes, and she told me how much she loves a traditional format: she looks first for job titles, and then she looks for key performance indicators. Summaries, she said, can be helpful, but only if they highlight and present essential information. How did you find out about a position? How do your skills and experience fit the job? Why are you interested in this job, and in this opportunity--at this organization? When I worked as a recruiter, less than 30% of the cover letters I received answered all of these questions in a concise and comprehensive way. The ones that did received the strongest consideration. The candidate who applied for every position we listed was never seriously placed under consideration. As a job seeker, it's important to answer the essential questions first and foremost. Once you've covered these basic ingredients, you can add the other elements that enhance interest: a demonstrated understanding of employer needs, information to show you've researched the organizational culture, a concise summary that showcases your writing ability and unique skills, a unique format that demonstrates your individual style....These are the "value adds" that can push you over the top--but don't ever forget the basics that get your resume read in the first place. Bottom line: You can include your own spin and creativity in the process, but make sure you've got all the basic ingredients as well! Show that you know how to follow the recipe first! Want to see how other members of the Career Collective have answered this question? Check it out, and let me know your favorite "recipes" for a non-traditional approach! Career Sherpa, Hannah Morgan: Are You a Cookie Cutter Job Seeker? Rarely have I heard anyone exclaim, "I just love career fairs!" And yet, career fairs can be the perfect opportunity to make new connections - after all, few people attend them as employers or job seekers if they aren't in the market for something. Here are my suggestions for how to navigate these events. 1. Take it seriously. Unless you are a visual art major and it's a "casual career fair," dress well--no jeans, tight clothes or white sneakers. Think: Summer's over, even if it's still warm outside. Ties, jackets, dress pants, dark shoes and socks for men. Shirts that don't show the navel and skirts or pants that don't defy gravity for women. Err on the side of conservatism. "She wore WHAT?" is always a perennial discussion among recruiters. Most employers will require you to apply for positions online to be considered as an official applicant. So don't be turned off by the line, "To apply for a position, go to our website. 3. Know who you want to talk to in advance, and have something interesting to say. Chances are good that you've heard a lot about the elevator pitch, and for good reason: You'll have under 30 seconds to introduce yourself to employers. An ice breaker that shows you are familiar with the organization's project and services--and culture. (I often recommend searching Google News by organization name, reviewing websites, and reviewing employer profiles on sites such as Vault and Glassdoor.) Many job seekers don't do this, and taking the time to read in advance can help you stand out. Not sure what you want to say? Check out 15SecondPitch.com, and the site's pitch wizard. It will help you condense and revise your "stump speech." 4. Don't be afraid to spend time with the "lonely employer." Job fairs can feel like popularity contests with lots of candidates in one line, and other booths that are almost empty. Stop by and say hello to the quiet tables, too. You may be surprised at what they have to offer, and it can be a great time to get one-on-one advice from the employer's perspective. 5. Get to know other job seekers at the event--especially when you are in line. Your next lead could come from the person standing in front of you or behind you in line. Making friends with others interested in the same company may seem self-defeating, but it isn't--especially given that you may have different interests, skills, and experience in terms of job function. Remember the common job search rule of thumb that over 60% of job offers are the direct result of networking! 6. When you talk to employers, keep your conversation focused and brief. Introduce yourself with a small handshake. Job fairs often feature long lines of candidates, and can be daunting to employers. Keep your ears open as candidates before you talk to employers, and consider introducing the employer to the candidate behind you in line if the discussion veers along a path of mutual interest. You demonstrate you are a team player when you introduce your "competition" with ease and present their interests, "This is Ben and he's also interested in brand management." When you demonstrate a high level of cooperation and courtesy, you can make an employer more willing to share their own business card--which, in turn, gives you a great vehicle to follow-up after the event. 7. Come early or stay late--and help employers or event organizers out if they are interested. Career fairs can be an exhausting endeavor for employers and fair exhibitors: Volunteering to help someone out can be a very smart way to get your foot in the door later--and to stay top of the employer's mind later. This is my career fair "short list." What is yours? Several months ago, I wrote about Alexandra Levit's, How'd You Score That Gig?, a book which includes a great personality quiz, the results of which correspond to cool careers by personality type. It's a great way to jump start your career search if you want to do something new but you aren't sure just where to look yet. But what if you know what you want to do but don't know how to begin? A great way to start is to listen to other people's stories; you can learn a lot by learning how other people have prepared--and trained themselves. Today, I'm listening to an episode about the careers of comedians and comedy writers Dana Gould "The Simpsons" and John Mulaney "Saturday Night Live." Check out the Sound of Young America and listen an episode or two. Do you have any "under the radar" sources of career how-tos? If yes, please share! Companies, organizations and individuals who help people find jobs are "hot" these days. So is the entrepreneurial spirit. With new companies and "fresh approaches" to the job search rapidly emerging on the scene, there are plenty of opportunities to get "burnt." It's important to learn how to spot the frogs among us. Today, I'm going to talk about how you can find those groups and individuals who have your best interest at heart. I am going to use MeetUp.com as an example because I am a MeetUp.com program organizer and facilitator. If you are seeking to join a career support group or pay-per-premium access website, be savvy: if required to pay upfront for access to job listings, interviews, or "placement services," ask questions before you enter into any agreement. If it sounds too good to be true, it might be. Here are three acid tests you can apply before you sign anything. 1. Ask for two or three names of customers you can contact for references. 2. Ask--or try to figure out--how a company makes money. What's in it for them if you join? Shortly before the dot.com bust, there were companies with 50,000 resumes but only 15 employers. 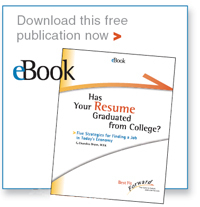 (The business model focused on advertising by number of resumes posted, not on the number of employers using the site.) Make sure your odds are good...and that your participation counts for more than helping someone "make bank." 3. On job posting sites, conduct general searches to assess the number of listings. If you are invited to upload your resume on a relatively new company website, ask how many unique employers they have reviewing resumes. Again, make sure the scales are tipped in your favor. Speaking of feedback, we love comments. What's on your mind? And what topics would you like to see next on this site? One of the benefits of maintaining your own blog independently is the freedom to write about issues that rise to the forefront--and are sparked by casual conversation. Today, "Max," a former student of mine wrote to me and raised an issue worth repeating: In a tough market, how do you gauge a safe move? And how do you pursue your career goals when you know what you want to do but the market isn't cooperating? In Max's case, he spent a year working in a prestigious New York law firm--then decided he was ultimately more interested in working in corporate finance in a role frequented by bankruptcy attorneys. His observation: "I know I don't want to practice law, but if school will help me land this role than that's the path I am going to take--especially since everyone I know who has my "dream job" has worked as an attorney!" I advised Max to apply the brakes before going to law school and seek out the advice of other people who work in his dream job before applying. After all, law school is an enormous commitment of time and money--and there may be more efficient routes he can take to achieve his career goals. Over the years, I've found that a vast majority of people enjoy it when you show interest in them and their work. After all, many people love to talk about themselves. That being said, asking for advice can be tricky and awkward, especially if you are asking people you perceive to be experts. For this reason, and because the following experts have provided insight on this issue with great eloquence and candor, here are three posts I highly recommend. "How to Ask Questions and Not Be Perceived as a Dumb---"
Dan Erwin, a management consultant, shares a great strategy for developing relevant questions. Equally important: he provides information on "who to ask," how to "make the ask" and "how to follow-up." The Brazen Careerist Penelope Trunk shares tips on "how to ask by e-mail."